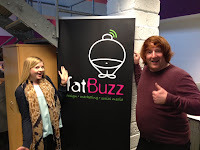 We revealed last month that we were looking for two new mouths to feed at fatBuzz - and we are delighted to announce that we have found the perfect candidates! Firstly, we would like to welcome our new Social Media Account Manager, Joanna Robb, to the team. Joanna had been interning with fatBuzz for six months, and she has always been a major part of the fatBuzz team, but we thought it was about time we made it official! Joanna graduated from Glasgow Caledonian University with a 2:1 Honours Degree in Marketing, and in addition to keeping the fatBuzz boys in check, she will work directly with a range of clients on marketing, social media engagement and developing online communities. While carrying out 'extensive' research for this post, we found out that Joanna used to attend RSAMD Theatre Group... which really does explain a lot! In all seriousness, Joanna is a real people person with an infectious, bubbly personality and we are confident that she will bring a range of additional skills to the team. We are also delighted to welcome our latest web developer/designer, Chris Winch, to the team. Chris is a web and graphic designer from Dumbarton, with vast experience in developing websites for a range of businesses across various sectors. We knew Chris was the perfect candidate for this role as soon as we met him; he is experienced, enthusiastic and ambitious, but most importantly, he fits in perfectly with the fatBuzz culture. Chris' main skills lie in HTML/CSS, WordPress and Graphic Design, but he is also vastly experienced with UX/Usability, Responsive and Mobile Web Design and Search Engine Optimisation (SEO). Interestingly, we have just found out that Chris and our other web developer David actually went to school together, although they didn't know each other at the time! It really is a small world, isn't it? In saying that, we are sure that our own little world will continue to grow and we look forward to welcoming lots of new faces to the fatBuzz team in 2013. If you've found this post interesting please use the share buttons below to tell your online community about it, there's a good chance they'll find it interesting too.